If it’s pink in the middle, it’s cooked too little. A catchy little tune drilled into me by a dancing burger. Undoubtedly commissioned to prevent BBQs from going down the tubes (literally), it was introduced to me in grade school. To this day, every time a dining companion ponders the inquiry of how they’d like their burger cooked, heart palpitations ensue. Just. Say. Well. In the case of tuna, for me, it’s always been to the contrary. Anything more than a light sear and it’s equivalent to pencil shavings. The silken texture I love is gone with the wind. Fluttering away with the pungent scent of a freshly opened can. Finding myself these days on new horizons, it seemed fitting to give canned tuna a second chance. In Korea, it’s economical and also readily available. Whereas fresh tuna stands out for its unassuming flavor, canned tends to be a bit musky. Deciding to harness this, I incorporated capers as a briny compliment. Finished with a healthy dose of lemon juice, misconceptions flew out the window. Paired with an assemblage of veggies, eggs, and potatoes, I had a tasty spin on an old French classic. Bon appetit! Whisk first three ingredients together in the bottom of a small bowl. Add oil, one tablespoon at a time, while whisking rapidly to emulsify. Finish with salt and pepper. Combine tuna, lemon juice and capers. Set aside. 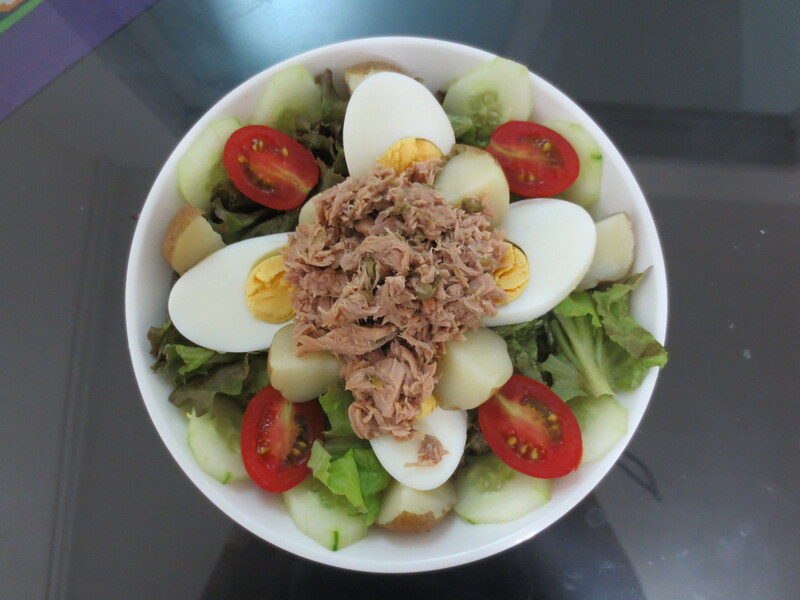 In bowls, arrange one-quarter each of lettuce, tomatoes, cucumber, potatoes, and eggs. Top with tuna mixture. Toss with dressing and enjoy!